Scotland's Ross Murdoch wins his duel with England's Adam Peaty to claim victory in the 100m breaststroke final at the British Swimming Championships. Also featured is Sophie Taylor, 18, who produced a stunning four-second personal best to set a new English record of two minutes 24.46 seconds en-route to winning the 200m breastroke final. 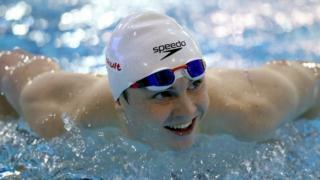 And Francesca Halsall celebrated her 24th birthday by securing gold in her favoured 50m freestyle event.